GuitarControl.com released a new video guitar lesson from GuitarControl.com instructor and creator Claude Johnson. In this guitar lesson, now available on YouTube.com, Claude Johnson goes over Day 4 of GuitarControl.com’s annual 12 Days of Christmas. It’s time again for GuitarControl.com’s annual 12 Day’s of Christmas event. In this video for Day 4 Claude Johnson talks about what specials and events will be coming your way in the days ahead. Johnson talks about the new and exciting things this year including some free lessons from himself and from GuitarControl.com instructors Darrin Goodman and Jimmy Dillon and some trivia contests with some great prizes. Claude also talks about the new one dollar Christmas song course that includes five new songs this year from Darrin Goodman. The new course is only one dollar and the proceeds go to the Blue Star Music Camp which is a great charity to help kids get into playing an instrument. 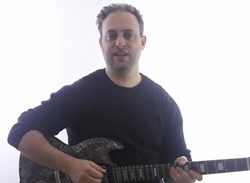 In today’s video Claude talks about a trivia contest that you can enter at http://ws1.guitarcontrol.com/blog/xmas/12-days-of-xmas/ on day four. The camp, founded and headed up by acclaimed guitarist and singer/songwriter Jimmy Dillon, is a located in Mill Valley, California and conducts sessions in Michigan and Austin, Texas as well. It is a great place for kids to 'learn the ropes" of being a professional musician.